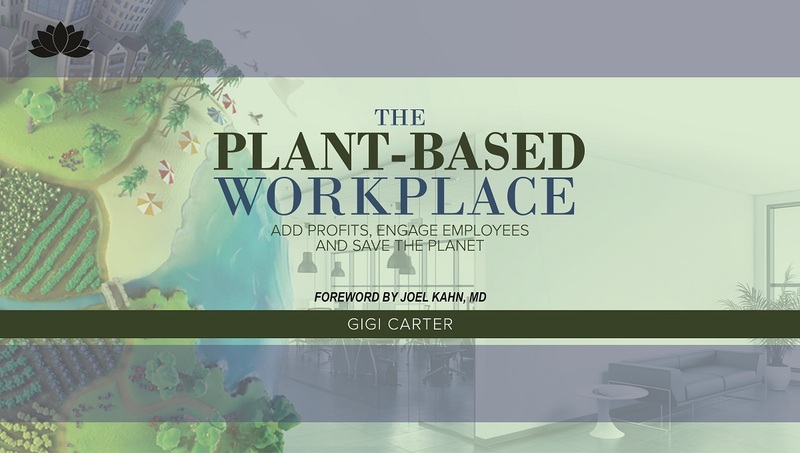 CEOs commit to reading or listening to the audiobook The Plant-Based Workplace: Add Profits, Engage Employees and Save the Planet. For those who respond “yes,” CEOs then ask: “Would you be interested in being a part of a group that will read The Plant-Based Workplace and come up with a recommendation that could work for our company?“ For any paperback books purchased for employees, the author will donate 50% of royalty profits to the charity of the CEOs’ choosing. Each section in The Plant-Based Workplace covers a key component of the plant-based food environment philosophy. Carter first takes readers through the science of chronic diseases and environmental impacts of food choices. She then makes the business case for the plant-based workplace and concludes with guidelines for on-site application. By demonstrating not only her success in overcoming health barriers but also her wisdom concerning fiscal issues companies face, Carter challenges readers “to make it personal” and take the initiative to implement an ambitious change model, step-by-step. To accept this challenge, contact Gigi Carter directly at gigi.mytrueself@gmail.com or (601) 201-5486. July 13, 2018: WeWork announced it is taking meat off the menu for environmental reasons. “New research indicates that avoiding meat is one of the biggest things an individual can do to reduce their personal environmental impact,” said McKelvey in the memo, “even more than switching to a hybrid car.” Link to Bloomberg article. October 3, 2018: Sodexo Launches New Plant-Based Menus Across Hundreds of University, Healthcare and Corporate Services Accounts Nationwide. Link to news release announcement. January 29, 2019: Over 80 investors warn that “animal agriculture is the world’s highest-emitting sector without a low-carbon plan.” Link to article in Sustainable Brands. Investors with combined assets of more than $6.5 trillion are calling on fast food businesses to set ambitious targets to reduce the environmental impact of their meat and dairy supply chains. Link to article in Poultry Week. February 9, 2019: During Tyson’s first-quarter earnings call Thursday morning, CEO Noel White said Tyson is using all its resources to make “great tasting [plant-based] protein alternatives that are more accessible for everyone.” Link to Arkansas Gazette article. America’s biggest meat producer wants to take a bite out of the lucrative vegetarian market. Link to Market Watch article.